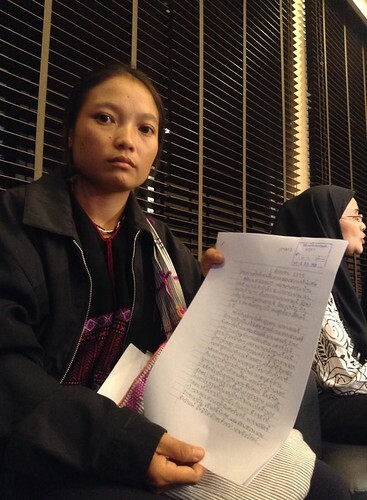 The wife of a Karen human rights defender who was disappeared last year has requested the Department of Special Investigation (DSI) to investigate the disappearance of her husband as influential people are suspected in the case. Phinnapha Phrueksaphan at 10 am on Thursday, 6 August 2015, submitted a letter to the DSI to request the agency to take up the case of her husband, Porlajee Rakchongcharoen, aka Billy, a Karen human and community rights activist, who disappeared on 17 April 2014. Phinnapha reasoned that the case should be handled by the DSI because many influential people are allegedly involved in the disappearance of her husband. Pol Maj Woranan Srilam, Director of the DSI’s special case division, accepted the case and said that the DSI is giving it priority. However, the Department needs to cooperate with the investigating officers to decide if the case could be categorised as a special case. He added that the Department will investigate the effectiveness of the investigating officers handling the case and if there are influential people involved in the disappearance of Billy as claimed. In April, the Provincial Court of the western province of Phetchaburi accepted an appeal to hold an emergency trial under Article 90 of the Criminal Procedure Code to investigate the alleged unlawful detention of Billy after the Appeal Court had dismissed a request a month earlier. In February, the five testified to the court that they had nothing to do with the disappearance. While requesting an appeal for an emergency trial, Phinnapha pointed out that Billy and Chaiwat were in dispute because in 2011 Billy assisted Karen villagers to file a lawsuit against Chaiwat in the Administrative Court for allegedly evicting and burning their houses, and therefore park officials might be involved the unlawful detention of Billy and his subsequent disappearance. She added that all the witnesses who have already testified in the case might be biased because they were working under Chaiwat, and pressed the court to establish the facts of the case as soon as possible. In January, the police filed charges under Article 157 of the Criminal Code (malfeasance in office) against Chaiwat and four other park officials for the alleged unlawful detention of Billy before his disappearance. In addition to the appeal, Phinnapha submitted a petition to the Office of the National Anti-Corruption Commission (NACC) , to urge it to accelerate its investigation into the park officials who witnessed the unlawful detention of Billy. Since last year, many civil society organisations, such as Amnesty International and the Cross Cultural Foundation (CrCF), have been campaigning to put pressure on the Thai authorities over Billy’s case. Currently, Thailand does not have a law which specifies the criminal offence of enforced disappearance. It signed the Convention Against Enforced Disappearance  in 2012, but has not ratified it. Therefore, it has no legal obligations under the convention.